Yomi Sode is a Nigerian-British writer and performer. In 2017 he was shortlisted for the Jerwood Compton Poetry Fellowship and was selected to join The Complete Works in 2016. 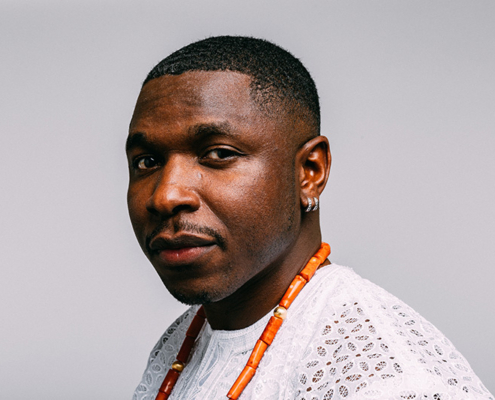 Yomi has performed at Lagos International Poetry Festival, Fest Afrika in Finland with Speaking Volumes and at the New York Public Library with the British Council, as well as touring nationally with his sold-out debut solo show, COAT. His writing has been published in Rialto Magazine and in the anthologies: Bare Lit (Brain Mill Press); Ten (Bloodaxe Books); Tales of Two Londons (OR Books) and SAFE (Orion Publishing). Yomi also leads workshops and projects in schools and universities and is currently working on his first poetry collection.